Filamentous fungus that is morphologically similar to Aspergillus spp. Most serious infections occur in immunosuppressed patients. Recovery from culture must be distinguished from colonization or contamination. Although a relatively common environmental mold, P boydii is a rare cause of human disease. It can be easily recovered from soil, water, and manure. Both community and nosocomial acquisition have been documented. In most instances, its recovery from culture specimens will reflect colonization or contamination; however, it is capable of causing serious infection in selected patients. When recovered from clinical specimens, it cannot be dismissed as a nonpathogen without careful consideration of its pathogenic potential in the clinical setting from which it was recovered. P boydii is a common environmental mold sometimes referred to as Petrolidium boydii. 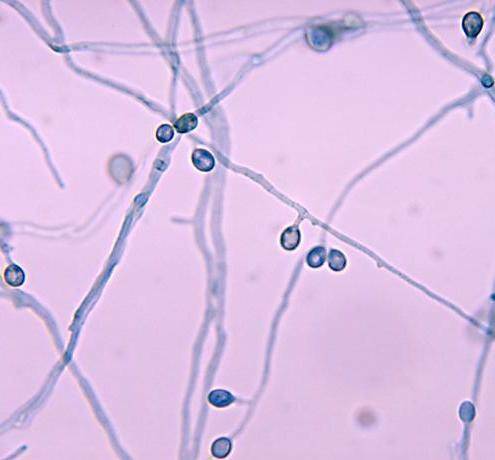 It is the sexual spore-producing form of Scedosporium apiospermum. In tissue, P boydii produces thin septate hyphae that are similar in appearance to Aspergillus hyphae. Hence it is not possible to distinguish P boydii infection from Aspergillus infection based on histopathology, and culture confirmation is necessary to establish the diagnoses and guide therapy. The portal of entry of P boydii is inhalation for lung and sinus infection or by direct inoculation of the skin at the site of trauma. Little is known about specific host defense mechanisms that permit opportunistic infection. Abscess formation and tissue necrosis are the typical findings of infection. Infection caused by P boydii is similar to that caused by Aspergillus spp. but considerably rarer. Among normal hosts, P boydii may cause fungus balls in the sinuses or in the lungs in patients with preexisting cavitary lung disease or chronic sinusitis. Penetrating trauma may result in soft tissue infection. It is the most common cause of maduromycosis in the United States. Infection involving the globe after penetrating trauma has been reported relatively frequently. A unique syndrome of P boydii in normal hosts is an overwhelming pneumonia after near drowning and aspiration of fresh or brackish water. Dissemination to the brain and other tissues has been reported in this setting. Among immunosuppressed patients, infection occurs in those with prolonged and profound immunodeficiency. Susceptible hosts include those with severe neutropenia, those with prolonged high-dose corticosteroid therapy, children with chronic granulomatous disease, and patients with HIV infection. Clinically and histologically, P boydii opportunistic infection in the immunosuppressed patient resembles invasive aspergillosis. This includes the propensity for hematogenous dissemination. Pulmonary infection is the most commonly encountered site of infection, but soft tissue infection, central nervous system infection, and other sites may be seen. Diagnosis of infection with P boydii is based on the recovery from biopsy specimens taken from the site of infection. Its recovery from sputum in a susceptible host with an appropriate syndrome is presumptive evidence of infection. Blood cultures are rarely positive. The microbiologic differentiation of P boydii infection from that of aspergillosis is important because P boydii is resistant to amphotericin B. The preferred therapy in adults is intravenous miconazole (see Box 4). Miconazole is rarely used to treat other fungal infections because of its substantial toxicity, which includes nausea, vomiting, anemia, and a variety of central nervous system effects. Cardiac arrest while receiving miconazole therapy has been reported. Nevertheless, for life-threatening infections, miconazole remains the drug of choice. Preliminary data suggest that other azoles, such as itraconazole and ketoconazole, are effective. Their use should be reserved for indolent cases or in patients who are intolerant of miconazole. The duration of therapy is not well established and should be based on response to treatment and improvement of underlying predisposing factors.